The theory of lymphatic spread of cancer represents a basic chapter in the book of modern oncology. It was Cabanas (Cancer 39(2):456–466, 1977) in 1977 who introduced in the clinical practice the sentinel lymph node dissection (SLND) to stage penile carcinoma. 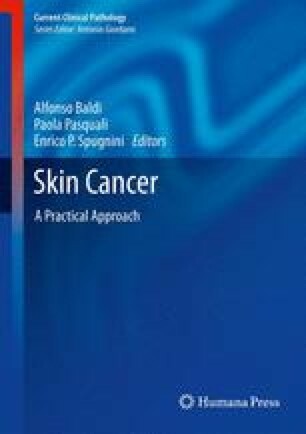 Since those early efforts, many studies have clarified SLND’s crucial role in the staging of ectoderm-derived tumors, particularly in melanoma and breast cancer; anyway, the efficacy of SLN biopsy in the staging or treatment of nonmelanoma skin cancer has still to be proved. Radiation detector that provides a count rate from gamma rays and facilitates the intraoperative identification of radioactive lymph nodes. Preoperative exam that allows to identify, by injecting a radioactive tracer in the site of primary neoplasm, nodal basins involved in the metastatic process. Surgical identi fication of the first node involved in lymphatic spread of cancer through a small incision and a limited extent dissection. Injection of a colored tracer in the site of primary neoplasm that complements lymphoscintigraphy and helps visualize the sentinel node during dissection.